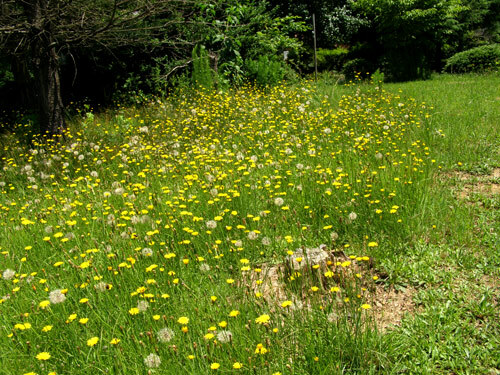 Every week, some little weedy wildflower will appear in an unmowed lawn, sounding the alarm for sentinels of homeowner associations. Watchdogs of Carrboro’s Homeowners’ Association (fictitious organization, I hope) must be out of town. I’ve enjoyed seeing numerous yards blooming vigorously during the past several weeks. The lawns of many front yards are refreshingly covered with white-flowering clover. Other yards appear to be infested with hundreds of little yellow flying-saucer-like flowers, hovering a foot or two above the green surface. And some yards are downright spectacular with the flying saucers hovering above drifts of white clover. One well-tended front yard was brilliant with a sea of bright-yellow flowers floating across it. I was sad when I returned to find the lawn had been subdued, mowed flat to its former green mat. The color and effect of unmanaged growth is just too much natural exuberance for many folks. The yellow weed we are seeing along unmowed road edges and in the lawns of more carefree gardeners these days is Hypochaeris radicata [hy-po-KEER-is rad-i-KAY-ta]. The common name, cat’s-ear, is a reference to the fuzzy-on-both-sides basal leaves of the plant. 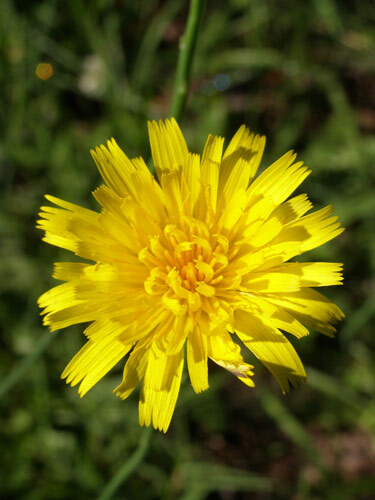 Some like to call it false dandelion because the flower head resembles the larger yellow dandelion. This one, however, stands 1 to 2 feet higher with several flower heads on a single leafless stem. Like the dandelion, cat’s-ear is a Eurasian introduction that has become naturalized. Take a closer look at a flower head. This is an example of plants in the aster (composite) family that have a tight cluster of individual flowers that are all ray flowers, unlike the typical sunflower, which has a circle of ray flowers surrounding a tight swirl of disc or tubular flowers. Each little ray flower of the head has a discernible row of five teeth at the outer end of the flower. This is also another of those plants with flowers that close up for the evening. The more you observe flowers, the more you will find that many of them have this opening-in-the-morning, closing-in-the-evening habit. Others, you will note, open in the evenings and close in the morning. Then there are the ones that stay open and demonstrate other characteristics. It all provides lots to ponder. This past weekend, thousands of cat’s-ears were carefully mowed from our highway medians, but you may still see bright-yellow flowers swaying in the breezes along the outer roadsides before routine mowing makes the edges carpet clean. If you mow your lawn frequently enough to keep the weeds or wildflowers from blooming, I challenge you to leave a few little grassy islands here and there during the next several mowing cycles; you may be pleasantly surprised at what reaches up and flowers for you. You may enjoy the little islands for the swaying grasses alone. However, if your homeowners’ association allows you to keep your little grassy islands, you may be required to fence them. A more carefree yard-lawn saves you time, money, reduces pollution and can provide interesting and beautiful surprises through the seasons. Go ahead, it’s worth a try.